It was Memorial Day weekend and time for another epic confluence and geodashing trip. Sam Gallucci and I would team up again to visit as many confluences as possible in a constrained amount of time. Our goal was to successfully visit at least 8 confluences and 20 geodashing points on this trip. 40N-118W lies on top of Table Mountain, an appropriately named peak that is part of the Stillwater Range. I had been planning for an adventure to visit my remaining six confluences in Nevada for quite some time. I had also looked for a new GPS with much more (trackfile) memory than my eMap. I finally decided to get a Garmin GPSmap 76CS. I purchased my new GPS following my recent successful visit to 37°N 112°W . It was today's trip when I realized that 37N-112W was my 76th “C”onfluence “S”uccess. Talk about serendipity! As we drove along with the windows open, we could hear them pop as we drove over them. If you have ever twisted packing bubble wrap until it pops, you have heard the final sounds made by these insects before turning into a gooey mess as we drove down the road. There was literally no way to avoid them – the road was completely covered with them and they were all moving. This could have been taken from a science fiction movie! What a great theme song for confluencing! Great music and we were on schedule: what could go wrong? We continued on a road stretching out towards the mountains in the distance. Continuing south, we arrived at what MapSource labels as the Anderson Ranch. We met two cowboys there who asked us if we were miners. We told them were adventurers on a quest to reach 40N-118W and had simply hoped to find the road continuing southwest so we could approach our destination from the south and have only a short hike with little elevation change. They said the road going south through their ranch didn’t go through (although the imagery appeared to tell another story). They told us how they would get there and even drew a map for us. Using my new Hi-Lift Jack we were able to quickly lift the Tahoe up high enough to put the spare tire on. We decided to continue back to Lovelock to get the flat tire repaired before we had a second flat. We found a motel for the night that had hot showers and even had internet access in the lobby. The next morning the tire guy at the defunct Lovelock Union 76/NAPA store said that it looked like we were going a little too fast on a dirt road. He was right. I thanked him for not gouging us for the tire repair – it was only $15 but the tire had a 2 inch puncture through the belts that was almost too much for the patch. We kept it in the trailer for the rest of the trip. If we had another flat on our trip, the repaired tire (now our spare) would have to be driven very gingerly. Our second attempt began by heading down the same road to nowhere and past all the old mines except this time we turned east on the road to Dago Pass, Pleasant Valley & Dixie Valley - following the directions we received the day prior. We stopped near a telephone switching station when the road started to really become rough. While we were unloading our ATV’s, the cowboys from yesterday were driving by and stopped to talk to us. They saw our cooler and asked if we had any beer they could buy – we gave them two of the premium microbrews that Sam had brought from San Diego. They thanked us and wished us success on our adventure. We continued our quest by ATV’s following the Kitten Springs Road into the canyon with the same name. One of our ATV’s had a mechanical issue after about 9 miles so we kept going on a single ATV until we stopped near a camp exactly as the cowboys had described in the E-W oriented Cottonwood Canyon. 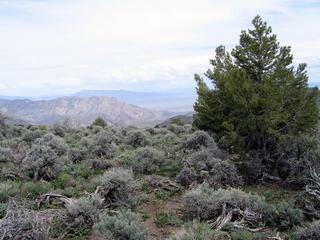 We began hiking up the northern side of the canyon to the top of Table Mountain around noon. Sam’s back had been strained during the ATV ride and began to threaten going out on him so he decided it would be best to stay back. We would remain in contact using our Garmin RINO’s. A fire had been through here in the last couple years – the entire side of the mountain had lots of burned trees. It was very tough climbing up the steep slope – this was going to be another difficult confluence. An hour and a half later, I was still 761 meters away, next to some melting snow and wishing we had approached from the west where the hike would have been considerably shorter with a lot less elevation change. In the distance I could see a small herd of wild horses. To my east, I could see several cows on one of the flat areas forming steps leading to the top of the “table”. Two hours after the start of my hike, I was on the top and standing next to the fence line mentioned by the previous visitors. I was well within 100 meters so I took my series of pictures from this high point as well before going down the hill a bit to the east to zero out the confluence. Picture #1 shows the general area and the tree at the confluence. Picture #2 looks north towards Cornish Peak. Buena Vista Valley and Alkali Flat are in the distance. Picture #3 looks east across the Stillwater Range. Dixie Valley is in the distance. Picture #4 looks south across the south end of Table Mountain. Picture #5 looks west. Carson Sink is visible in the distance. Picture #6 shows my GPS location. Picture #7 is from halfway up the hill looking southeast towards where I started my hike. Picture #8 shows the cows on top of Table Mountain. Picture #9 shows the final vertical step and the last remaining winter snow before I was on top. Sam was able to keep tabs on me using the RINO’s polling feature. Voice communication had been intermittent but here, some 2000’ above him, he could still poll my position. This worthy confluence required 61 miles by Tahoe, 21 miles by ATV, and 5.4 miles hiking. It took most of the day after we got our tire fixed and was quite the adventure! How DID those cows get up there? Onward towards 41°N 118°W – we hoped before sunset!